I love scarves. Love love love. But I have never ever owned an infinity scarf. That means that all the scarves you've seen here before are normal scarves, but they are secretly tied to look like infinity scarves. Annelise a.k.a. scarf sleuth... or not. 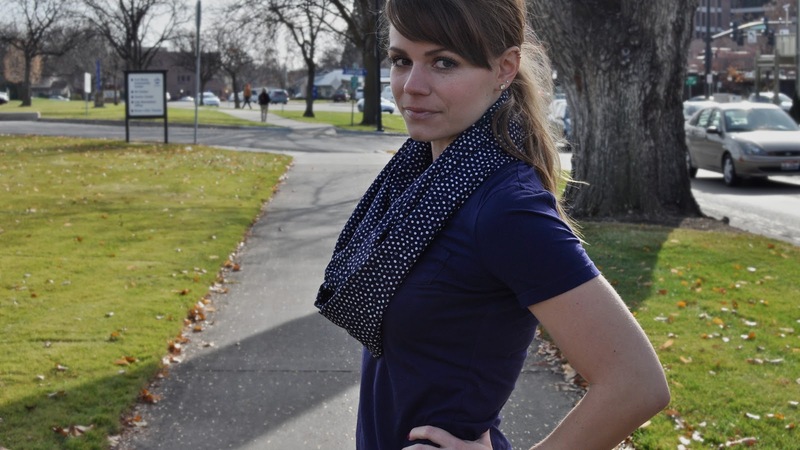 I'm in love with this navy blue & polka dot number from Kintage. The textured dots, the feel of the fabric (not too light, not too heavy)—it's just perfect. I'll tell you right now: you'll be seeing a lot of this scarf in the future. I officially want it in every color, especially this one. Christmas Wish List item #1? I think so. PS> 4-days 'til the wedding! The countdown is on! LOVE the outfit. You are just too adorable. I LOVE this scarf! Need. 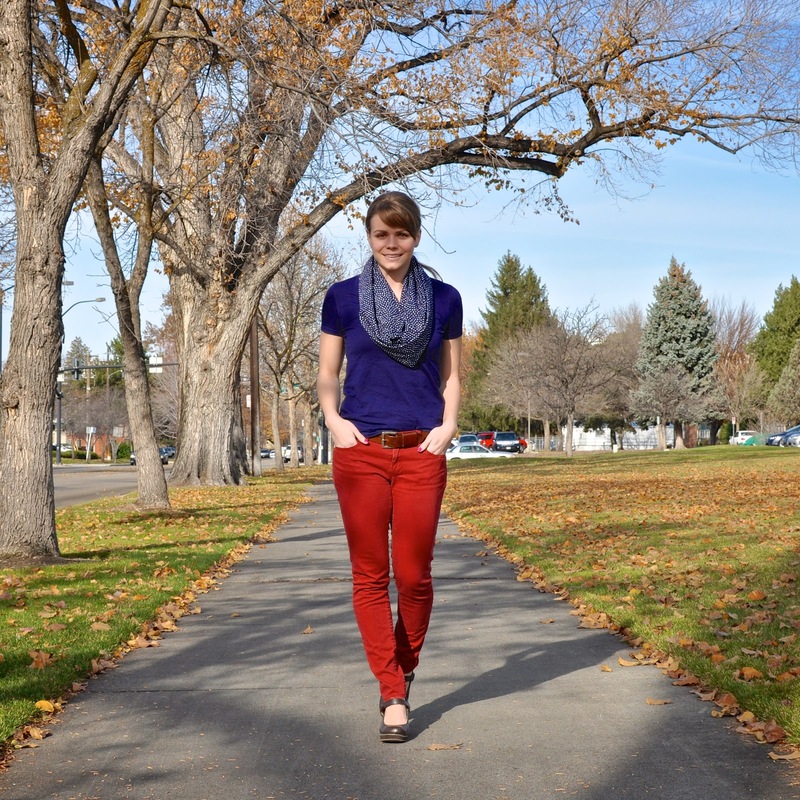 also the red pants. I almost bought some red maternity pants the other day, but I wasn't brave enough! I love that scarf too! Your whole outfit is cute! The week before the wedding is the best! Enjoy every moment! The actual day goes by so fast! I've never owned a scarf because I wasn't sure I could pull them off. BUT now I want them all. ha. I have two, a pretty SUPER SOFT gray one and a black and white herringbone one. I want one with polka dots because that's my FAV! Love this one! But the shoes are my fave!!! The scarf is my fav thing about your outfit, so cute! You do such a great job of 'faking' the infinity scarf. I had no idea. so cute! 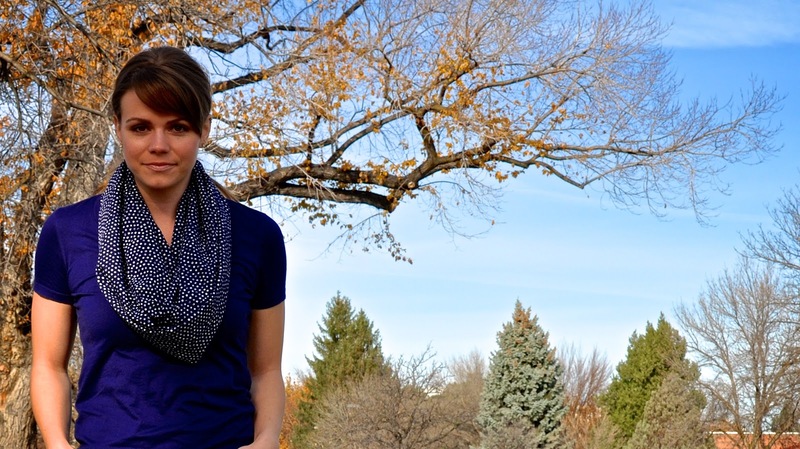 i am an infinity scarf junkie, i love them...all kinds! I'm with you, I can't stop buying scarves and it is sadly to the point where I forget all the pretty ones I already own, because everything is stuffed on a few shelves and I can barely remember scarf #115 and rather buy #116. I strongly believe that a scarf (the right one) can go with any outfit, so it doesn't hurt to have a bunch! Yay for four days - I am sure you are freaking out a little here and there...I can only imagine, I would! Enjoy the anticipation! 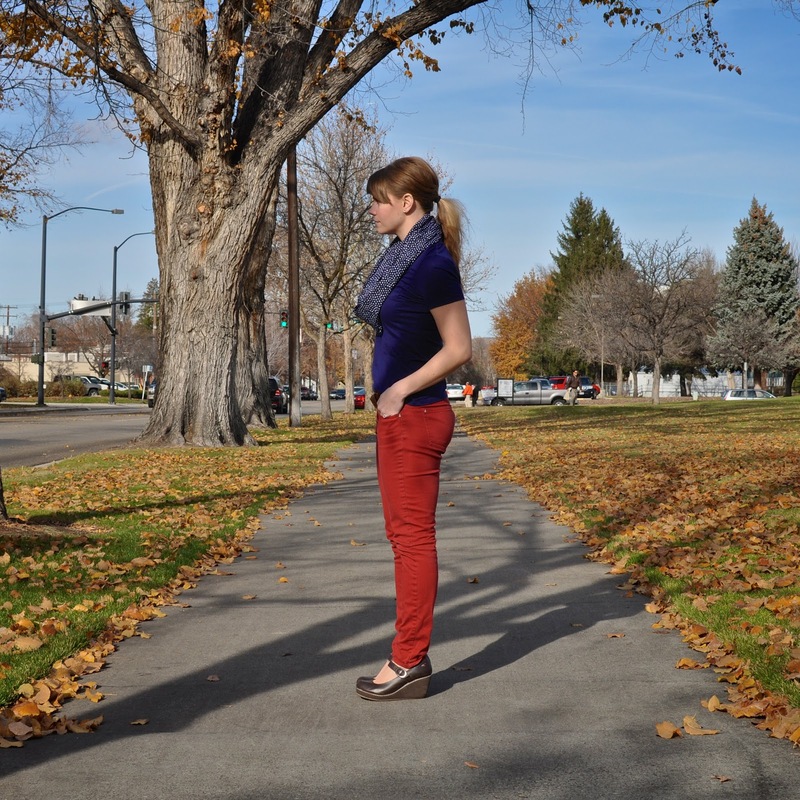 Love your red skinny jeans! And eek four days?! Can't wait to see all the pics from your wedding! Aw cute scarf! I may need to steal this to brace for a long winter ahead! Absolutely my latest obsession....LOVE it!!! I have about 20 different ones on my wishlist at the moment! haha I have totally done the same thing with my scarves to make them infinity style! And come to think of it, I don't own one either! This scarf is adorable. And goodness I'm sure you have a crazy week ahead! Sending great thoughts your way to get it all done. 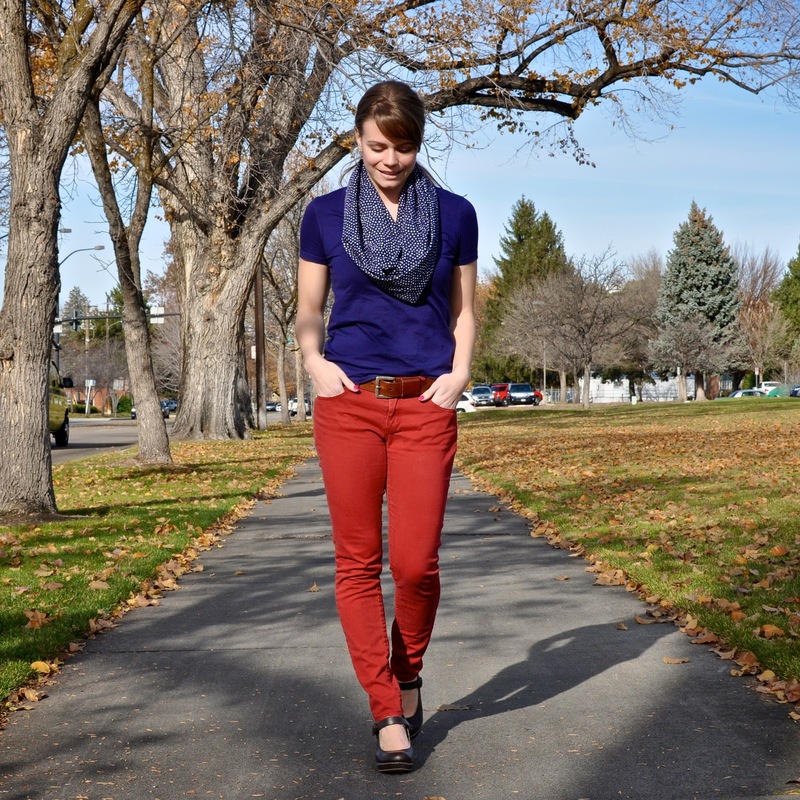 I LOVE red pants :). Super cute! I secretly tie all my scarves to be infinity scarves too! Please do tell your secret way of how you tie your scarves!!!! Since I cannot tie a scarf normally and/or cute to save my life, I need to either a) have you teach me your ways! or b) buy all the infinity scarves. So genius! You look great! You're so stylish! 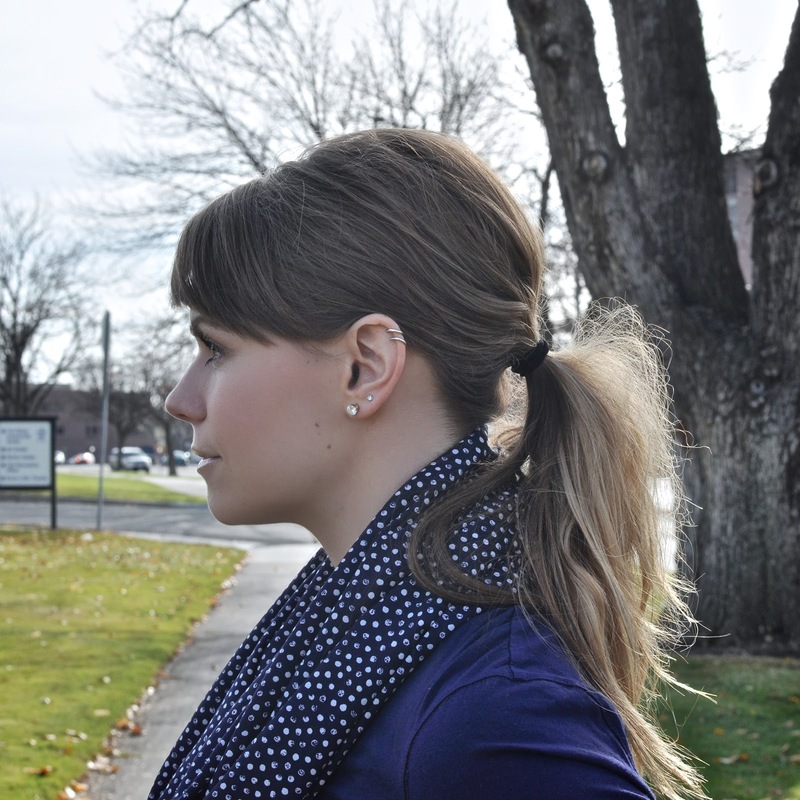 I love it :D And that's how I do all of my infinity scarves, too - I have yet to buy a real one. Whatever works!